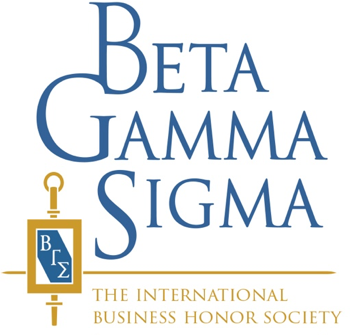 Founded in 1913, Beta Gamma Sigma is the international business honor society for AACSB-accredited schools, which are the top five percent of business school programs around the world. The University of Rochester Beta Gamma Sigma chapter was created at the graduate level in 1964 with the first undergraduate class being inducted in 2018. The Mission of Beta Gamma Sigma is to encourage and honor academic achievement in the study of business, cultivate and celebrate leadership and professional excellence, advance the values of the society, and serve its lifelong members. Beta Gamma Sigma is a proud member of the Association of College Honor Societies (ACHS). For the full list of membership benefits, please visit the BGS website. Students invited to join Beta Gamma Sigma are notified during one of their business classes in the spring semester*. The ceremony includes the president of the University of Rochester Beta Gamma Sigma chapter along with other undergraduate business program staff and faculty members. Students are formally recognized for their academic achievement and given their invitation. *Not every student that is eligible to join Beta Gamma Sigma is tapped due to the logistics of organizing the tapping ceremonies, but all students will receive an invitation via email.